Chris Hailey (11) receives an award during the awards ceremony at the conference. Harker DECA will host a study session in preparation for the state conference this Friday at the Innovation Center. Ninety-two upper school students attended the Silicon Valley Career Development Conference (SVCDC) to compete with fellow Bay Area DECA chapters from Jan. 8-10 at the San Jose Marriott. Upwards of 1,400 students from 26 Silicon Valley high schools came together to bring their business, leadership and finance skills to competition. In addition to competing, students enjoyed a dance, socialized and took advantage of networking opportunities. Students left campus at 1 p.m. on Friday afternoon. After checking in, participants took written examinations and attended the opening ceremony. On Saturday, students competed in roleplay and written events, followed by elections for the Silicon Valley District Action Team (SVDAT). Three Harker students, Alisa Su (10), Haley Tran (11), and Erin Liu (9), were elected for Vice President of Public Relations, Executive Vice President, and Vice President of Fashion. The final day was comprised of the awards ceremony and a breakfast. This year, Harker received a record number of awards. Out of the 92 students that attended, 10 individuals and teams came in first, while dozens of students were recognized as finalists in their respective events. First place winners included Chris Hailey (11), Enya Lu (9), Michael Sikand (10), Dolan Dworak (10), Rahul Mehta (10), Vanessa Tyagi (10), Sophia Luo (12), Shannon Hong (12), Arnav Tandon (11), Alexis Gauba (11), Ria Gandhi (11) and Raymond Xu (11). Overall, Harker’s DECA Chapter had the highest percentage of finalists and first place wins per capita compared to other schools. Although Monte Vista High School achieved 13 first place wins, they brought over 120 students to the conference. Junior Alexis Gauba, VP of Competitions and first-place winner in Business Services Marketing, commented on the benefits of SVCDC. SVCDC also gave freshmen an opportunity to experience their first competitive business conference. Kelsey Wu (9), finalist in the Entrepreneurship Innovation Plan competition, reflected on her positive first taste of DECA. 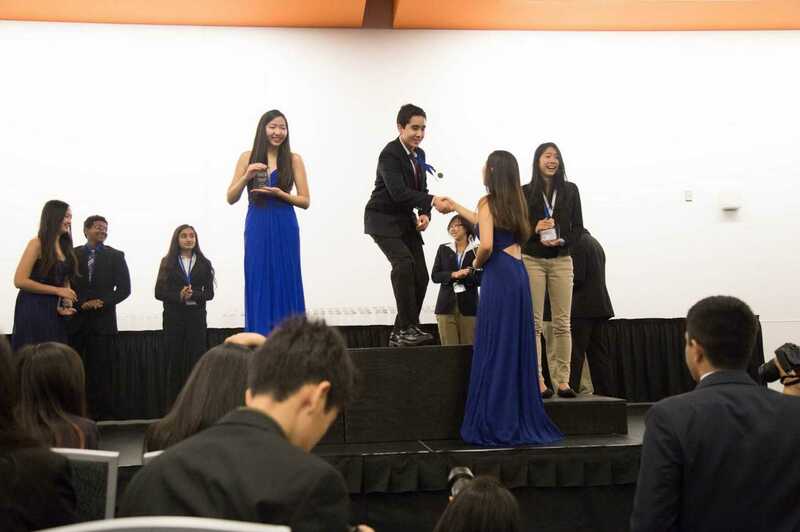 Juston Glass, director of business and entrepreneurial programs at Harker, commented on what Harker DECA learned from the conference, as well as the group’s performance at the conference. The DECA chapter is now preparing for their next competition, the California State Career Development Conference (SCDC) in San Diego from March 2-6. This first prep session for States will be on Friday, in the Innovation Center.